ClearPath radio rontrolled wireless kits come with two square transmitters, two square activation switches, (your choice of face plate style) and one receiver. 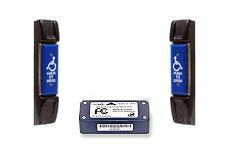 Everything needed to wirelessly activate your existing door opener. ClearPath radio rontrolled wireless kits come with 2 narrow style transmitters, 2 narrow activation switches, (your choice of face plate style) and 1 receiver. 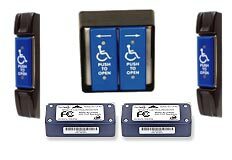 Everything needed to wirelessly activate your existing door opener. ClearPath radio rontrolled wireless kits come with two 4" round transmitters, two round activation switches, (your choice of face plate style) and one receiver. Everything needed to wirelessly activate an existing door opener. 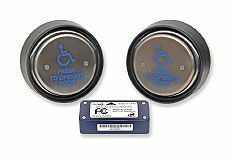 ClearPath radio rontrolled wireless kits come with two 6" round transmitters, two round activation switches, (your choice of face plate style) and one receiver. Everything needed to wirelessly activate an existing door opener. 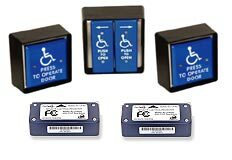 The vestibule radio rontrolled wireless kit comes with two 4" square & one dual transmitter, two square & one double plate activation switch, (your choice of face plate style) and two receivers. Independently opens 2 doors in a vestibule. 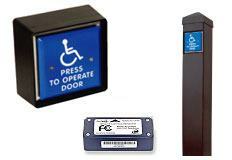 The narrow style vestibule wireless package comes with 2 narrow & 1 dual transmitter, 2 narrow & 1 double plate activation switch, (your choice of face plate style) and two receivers. Independently opens 2 doors in a vestibule. 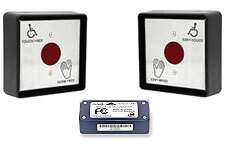 The 216 wireless infrared package comes with the transmitter and IR detector all built in one package. The CPRX receiver is also part of the kit. It is commonly used in clean room or surgical room applications where a germ free environment is needed. 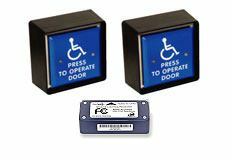 The bollard post package comes with a 5" x 5" steel post (grey or bronze) with a 59 series switch and transmitter installed, one 59 series switch, one CPTX transmitter and one CPRX receiver. Different configurations are available.